Editor's Note: Ms. Kazue Tanaka is a Japanese writer/translator who has translated Robert McCammon's stories from Night Visions IV into Japanese. 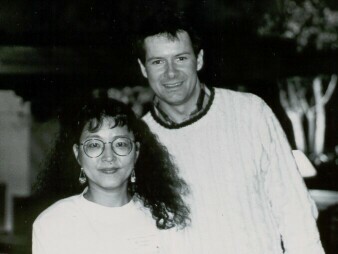 The following interview was conducted at the 1990 World Fantasy Convention, where Ms. Tanaka finished up a month-long visit to the United States. Ms. Tanaka is currently at work translating McCammon's 1981 vampire epic, They Thirst. McCammon: I'd like to know how you go about translating, say, one of my books. Do you read the book first? Tanaka: Yes. Usually I read the book a couple of times and then I start translating. Maybe you know that we have a completely different grammatical diction from English, so we can't put a word in the same order in Japanese. Usually I read a sentence and grasp the meaning of it and reconstruct it in Japanese. McCammon: I would think that would be very difficult to do. McCammon: I'm sure it is, because there's such a great difference in the grammatical form. You have to be very careful, I guess, in terms of reading in English and translating to Japanese. That seems to me to be very difficult. How did you train to do this? Tanaka: Usually we have some kind of mentor or teacher. McCammon: Were you like an apprentice, and someone teaches you to do this? Tanaka: Yes. We put the original stories [beside] the translations and compare the sentences. McCammon: How long would it take you to translate They Thirst? Tanaka: It depends on how long the story is. They Thirst will take at least three months. How long did it take you to write it? McCammon: Well, it took about six or seven months to write. Tanaka: Maybe I'll need that kind of time, too! McCammon: But it's almost like, if you're interpreting, you're almost doing some writing yourself. If you're making something more concise, or—do you do that? Are you abridging? Do you think anything gets changed in the translation? Tanaka: We try not to change, but sometimes a little change is necessary. We don't have some things that you have here in America. For instance, some brand names. We don't have the culture of your country, and the Japanese readers don't know if I translated correctly, but it is impossible for Japanese readers to understand that culture. Maybe, in that case, things get changed sometimes. McCammon: Do you feel that you interpret the story more so your countrymen can understand what's going on in the book? Do you think you add more of your culture to the story? Tanaka: Basically, we don't add anything, we don't take away anything. But in that case, we explain [the cultural differences] after the story in an afterword. McCammon: How many books have you translated? Tanaka: Maybe twelve, or something. Among them, Brain Child, by John Saul, and some mysteries. I'm going to translate some stories of Orson Scott Card's. McCammon: I think it would be very interesting, if I could read Japanese, to read my book and see what the changes are. Or how it's geared toward that culture. Tanaka: Conversation—when people talk—is very difficult to put into Japanese. If the character is a woman, a man, a boy, or a girl, Japanese has a very distinctive way of speaking. Especially between a man and woman. English does not have as much difference. McCammon: Well, that's fascinating. I think it would be a very tough thing to do—to translate something into an entirely different culture and still have the flavor of the American version, at least. I wouldn't want to do it—I don't think I could do it very well. Tanaka: Your stories are very American—that may be why they appeal to Japanese readers. McCammon: Really? I was going to ask you why my stories appeal—if they do appeal—to Japanese readers. Well, first, I didn't know that horror fiction was so popular in Japan. Is it? Is it becoming more popular? What do you think the situation is? Tanaka: Your [novels] have not been translated at all yet. So, apart from you, Stephen King and Dean R. Koontz are very popular—they are as popular as other big writers. Other horror writers are not so well-known. Some very keen fans like American horror. McCammon: Why do you think that is? King and Koontz are definitely very American writers. Do you think that's their appeal—the American style? McCammon: Not necessarily because of the story being told, but because maybe it's told in an American voice? Tanaka: Yes, sometimes. I'm still trying to [learn] the American voice—it's very hard to do. McCammon: Well, I know that's very tough to do, and I'm looking forward to seeing the books when they are translated. Tanaka: I'm looking forward to it too!